This 100% natural amber pendant is really a great piece of jewelry. The bail of this pendant is constructed out of genuine .925 sterling silver. The sterling silver adds a classic touch to the pendant, but the real beauty lies in the amber stone. The amber stone is a great example of the beauty created at the hand of nature. The stone is a translucent honey color, which really comes to life when it comes in contact with light. The amber comes from the Baltic region of Russia, which is the premier location for high-quality amber. The pendant measures Approximately 2 1/4" in length, and 3/4" wide, and would make a great gift for most any occasion. One of the best qualities of this pendant is its versatility. The combination of silver and amber form a balance which makes this piece of jewelry work with many different looks. It can be a great compliment to a more natural style, or a great contrast to a more classic look. 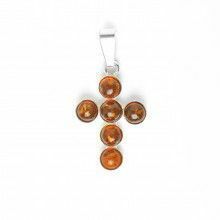 Due to the fact that each piece is hand-picked, and polished, the amber stone will vary slightly from pendant to pendant. Pendant Measures Approximately: 2 1/4" x 3/4"